Alexandra decided the bedroom should be gender neutral to accommodate all occupants. This posed a unique challenge for the design. 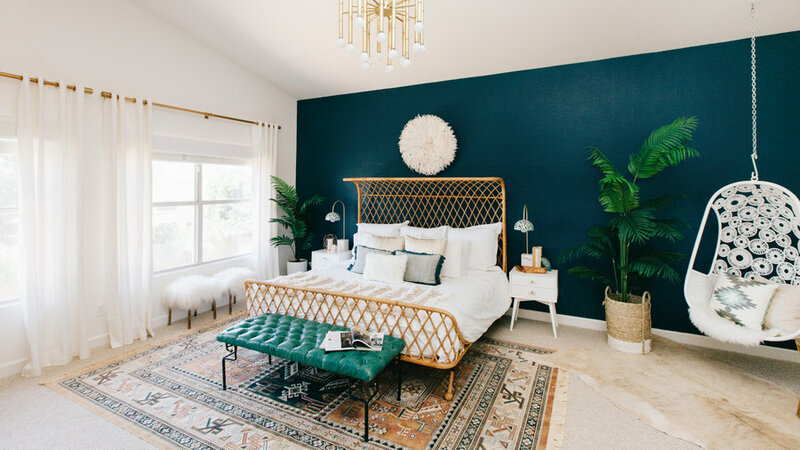 “Alex's inspiration was very bohemian, so we had to figure out how to create a more masculine bohemian vibe, which we accomplished by pulling inspiration from the Arizona desert to create something unique from the typical girly bohemian aesthetic,” Jessica says. To achieve gender neutrality, Jessica and Alexandra combined more masculine elements like neutral colors, deep tones, and natural materials with fur, feathers, and metallics. 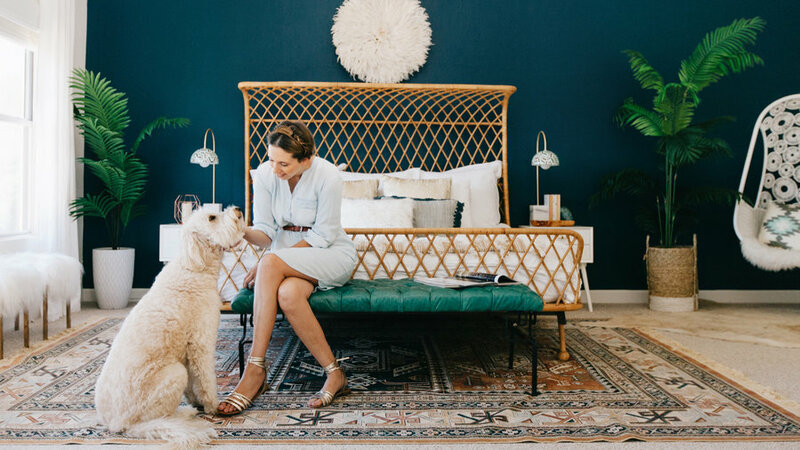 They also brought in whimsical elements such as a hanging chair, furry ottomans, and a curved rattan bed. 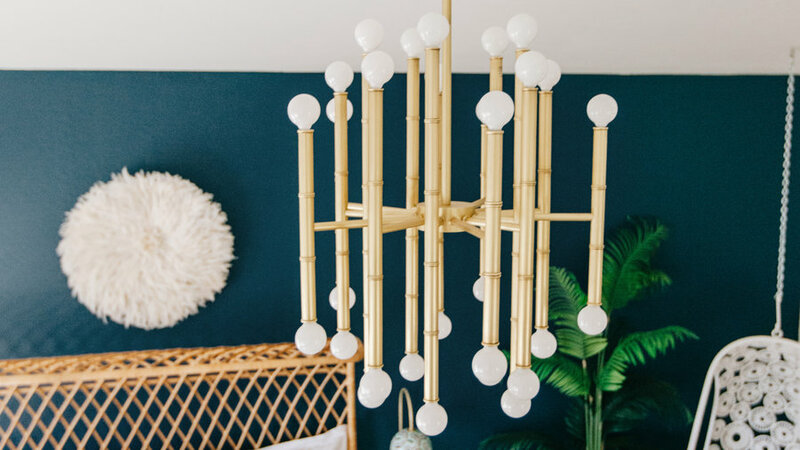 Here, the brass chandelier draws the eye up emphasizing the airy space. The bedroom’s bones lacked interesting structural elements, posing a challenge for the design process. 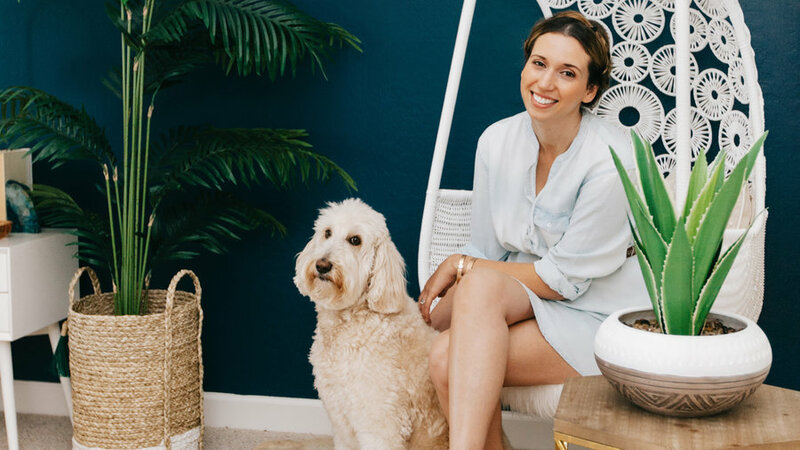 “The space had very little architectural elements, so we had to add visual interest in other ways,” Jessica says. They brought in a really unique bed to solve the problem. A curving headboard creates a canopy-like effect while not being too feminine. The space started as a big white blank box. 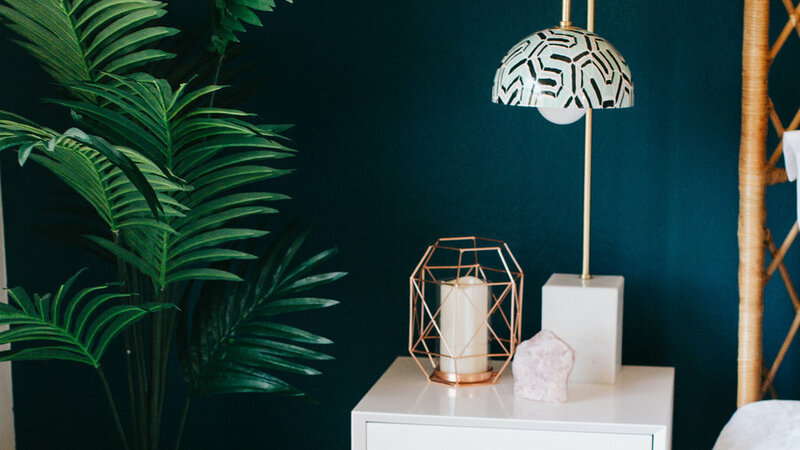 To add depth and visual interest, Jessica suggested a dark turquoise accent wall behind the bed. They considered wallpaper but felt paint was more timeless. 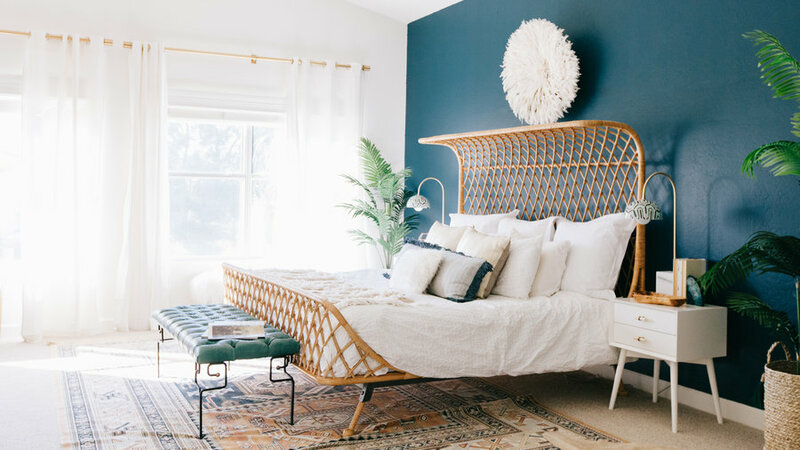 The dramatic hue serves as a bold backdrop for the incredible bed. White bedding and a beige juju hat provide a satisfying contrast. Alexandra gave Jessica two important requests: a comfortable king size bed and two cozy reading chairs. An upgraded bed, however, left little space for her literary nook. The solution pleasantly surprised Alexandra. 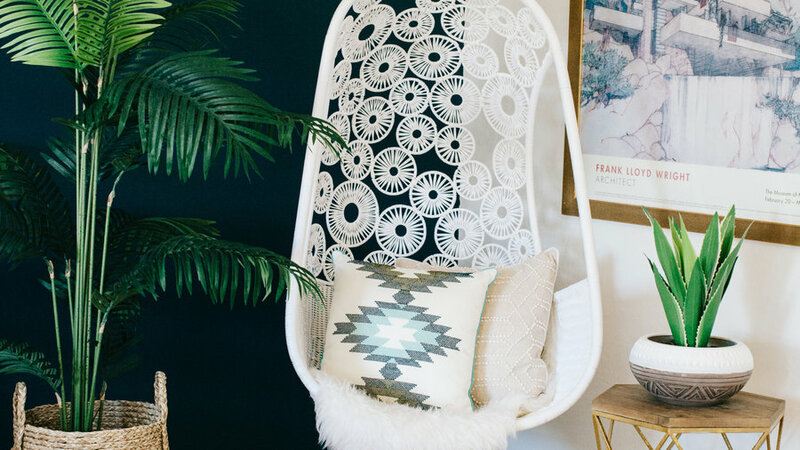 To accommodate both cost and space, they installed a dreamy hanging chair. 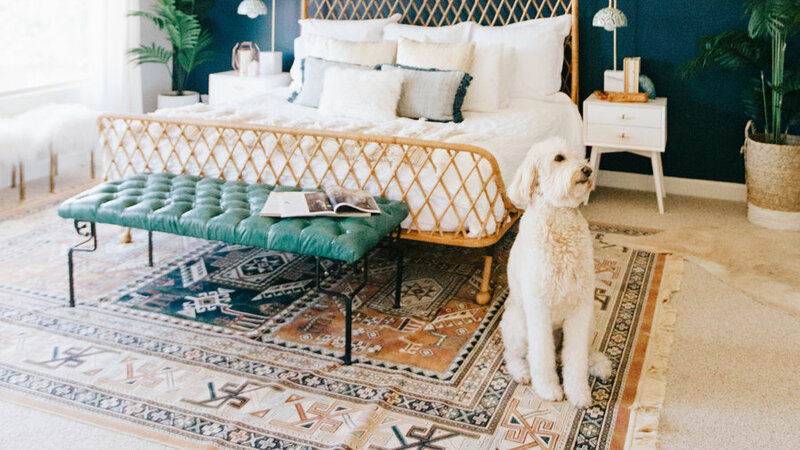 To cozy up the reading nook, Jessica layered a cowhide partially on top of the larger area rug. 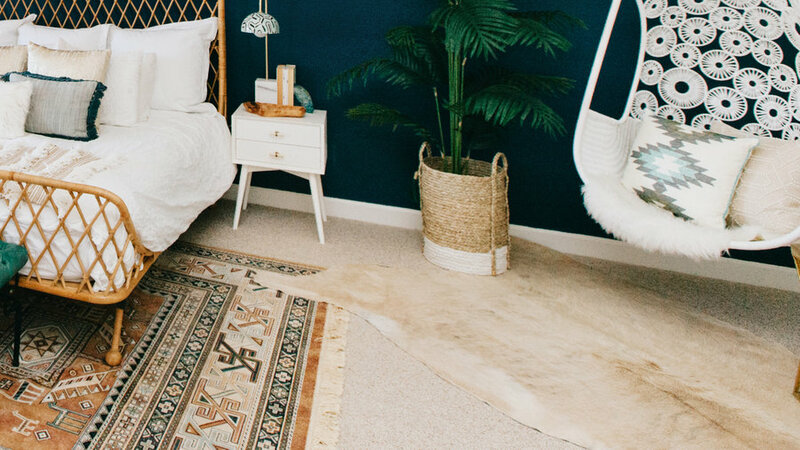 She felt the corner under the hanging chair was missing something, and the layered rugs made all the difference. 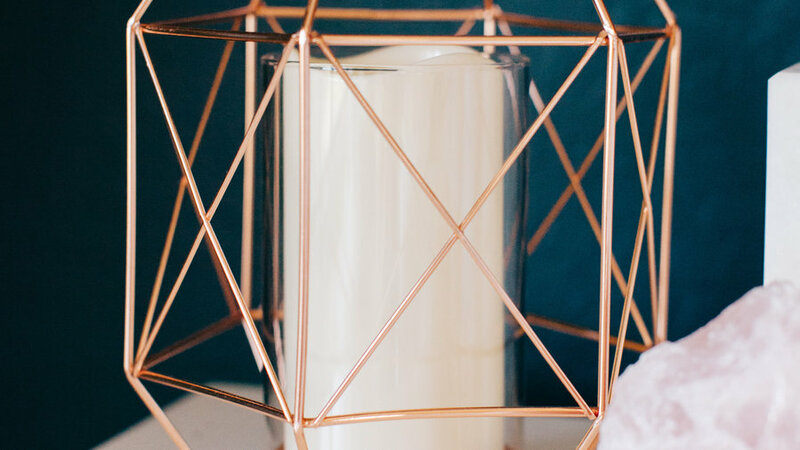 A rose gold candle holder adds an element of glamour to the bedside table. Get the look by searching for himmeli-shaped accessories. A pair of bedside lamps double as artwork and light source. 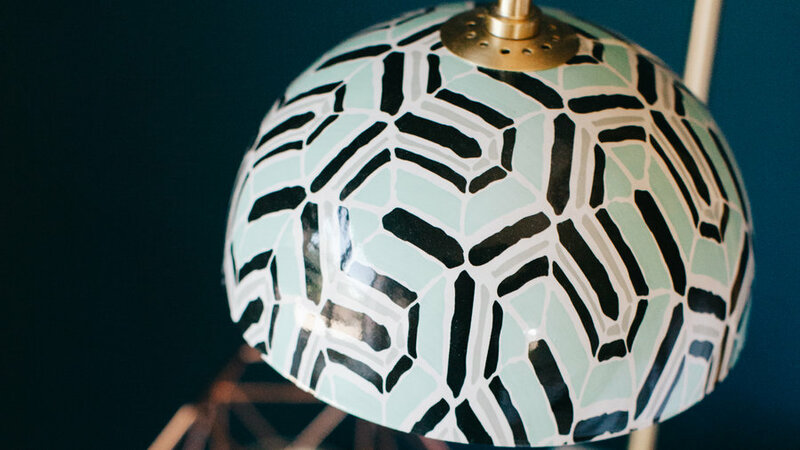 The painted metal shade grounded by a marble base belongs in a modern art museum. Echoing the brass chandelier, the curved pole contributes another metallic element. 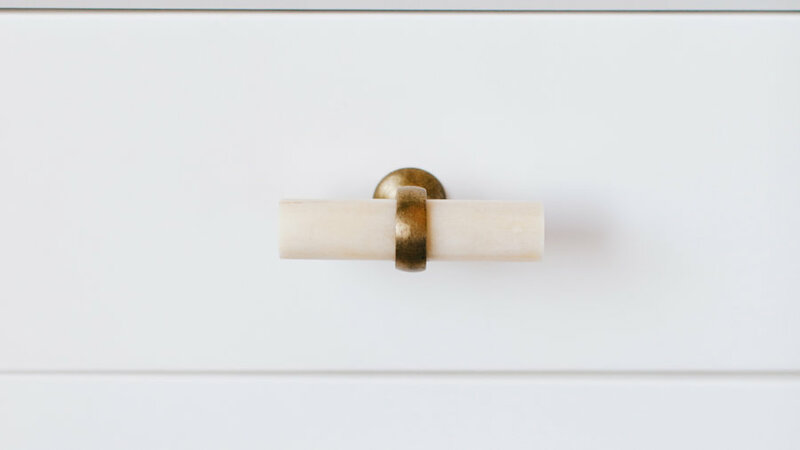 Each nightstand features two pulls that look like tiny wrapped notes. The mid-century tables resemble iconic ‘50s and ‘60s silhouettes with slim legs. 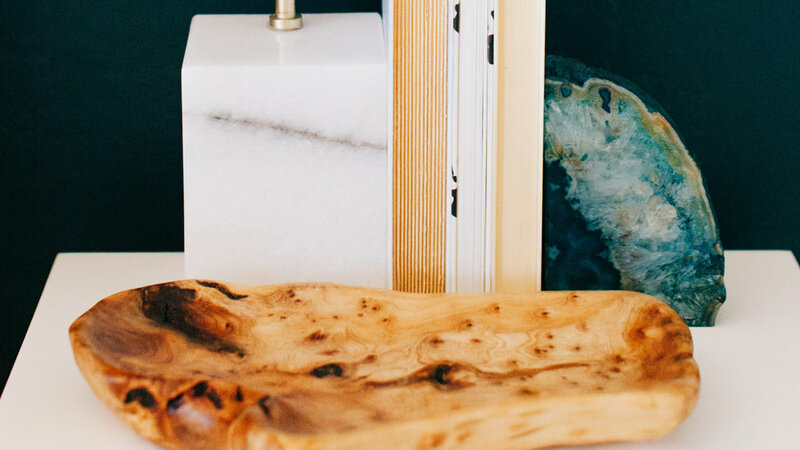 On one nightstand, an agate serves as a trendy bookend. Notice how Alexandra faces her books pages-out, taking advantage of the neutral shades of aging paper. 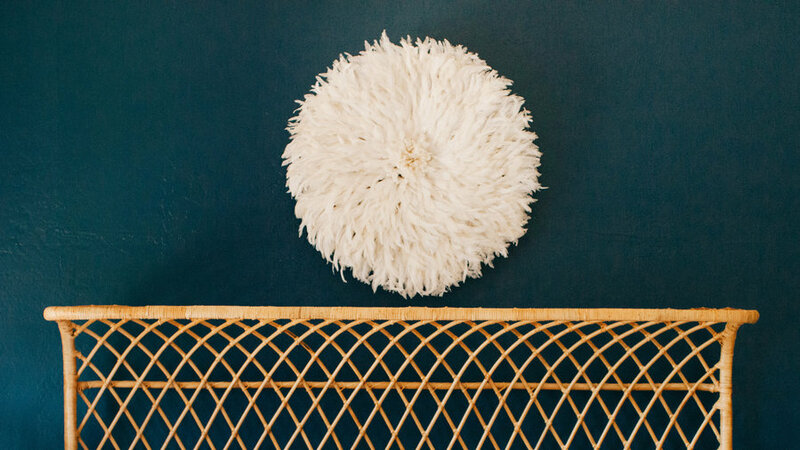 A wooden tray makes for a sculptural catch-all. 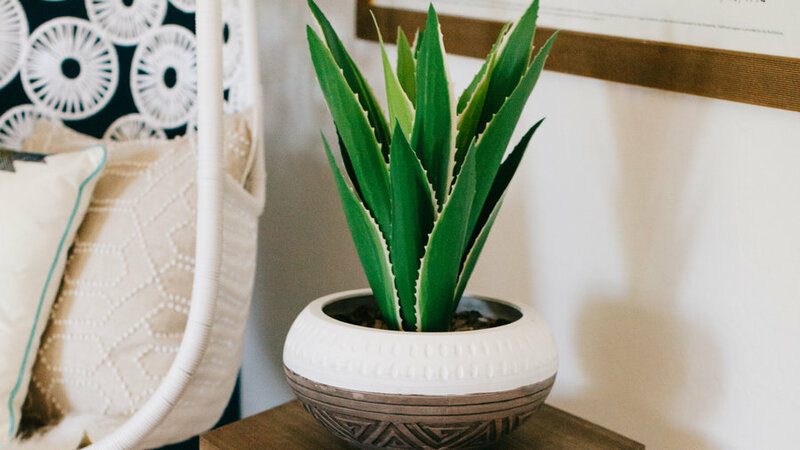 Three different plants bring a natural element into the airy bedroom. The broad green leaves contribute to the bohemian aesthetic.